As much as 39 percent of overall ecosystem carbon can be stored in longleaf pines’ trunks and branches. Photo by Albert Herring, courtesy of Wikimedia Commons. Butnor and his colleagues studied carbon storage in longleaf pine ecosystems across the southeast – from North Carolina to Louisiana. The research team was led by Lisa Samuelson, a professor at Auburn University and the director of the Center for Longleaf Pine Ecosystems, and the study was published in Ecological Applications. 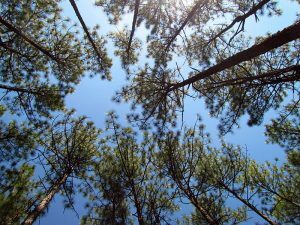 “We quantified carbon storage in 20 longleaf pine forests,” says Forest Service plant physiologist Kurt Johnsen, a coauthor. Each forest was specifically managed for longleaf pine and prescribed burns were conducted every three years. “Older trees tended to store more carbon than younger trees,” says Butnor. “The increase was mainly due to the older trees’ larger trunks and branches.” In older stands, as much as 39 percent of the overall ecosystem carbon was stored in the aboveground parts, while in the youngest stands, less than 1 percent was stored aboveground. Trees also store carbon underground, in their roots. To estimate the amount of carbon stored in living roots, the scientists used ground-penetrating radar as well as excavations. Longleaf pine roots can extend more than 70 feet from the base of the tree and accumulate carbon for centuries. Photo by Justin Meissen, via Flickr. Longleaf pine roots are extensive and play a significant role in carbon accumulation. The lateral roots, which run horizontal to the soil surface, can grow more than 70 feet in any direction from the taproot. Butnor and his colleagues found that these lateral roots stored large amounts of carbon. As stands grew older, the proportion of carbon stored in living roots increased. Much of the remaining carbon in the longleaf pine ecosystems was stored in the soil. Soil carbon was not related to the age of the stand, but was related to the site’s physical properties and productivity. The amount of ecosystem carbon stored in the soil ranged from 39 to 92 percent. 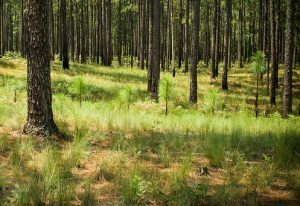 Longleaf pine stands typically have rich understories of flowering plants and grasses, but the study revealed that only a tiny portion of the overall ecosystem carbon is stored in these understory plants. Similarly, the amount of carbon stored in the forest floor and dead wood was small – probably because the stands were frequently burned. 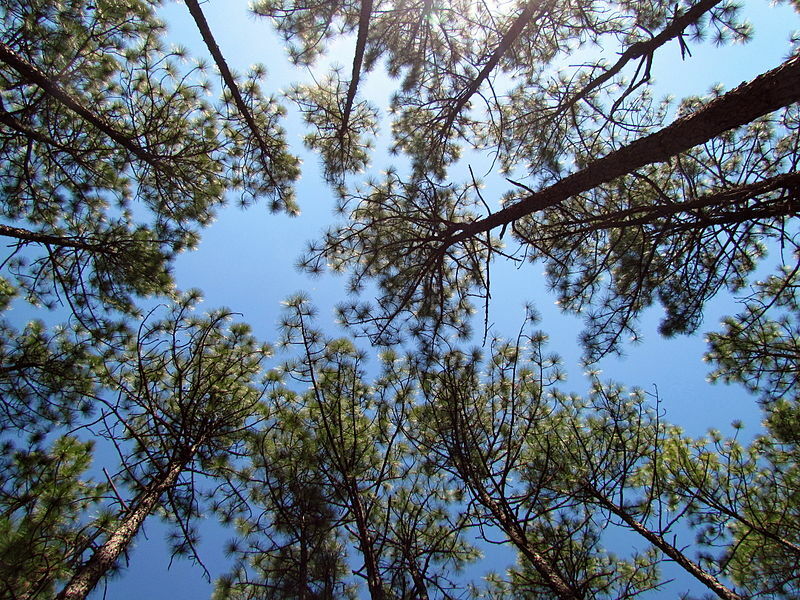 Over the short term, other southern pine stands store more carbon than longleaf pine stands. 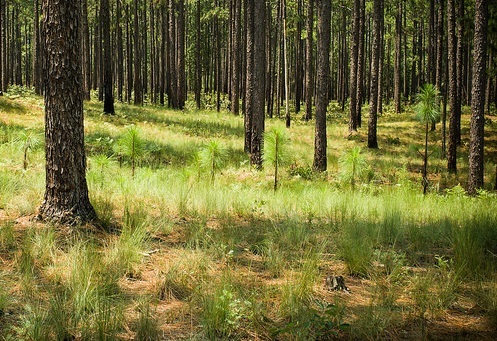 However, the way longleaf pine is typically managed – with longer intervals between harvests and less biomass removed during intermediate harvests – increases the species’ carbon-storing potential. “In addition to the many other benefits longleaf forests provide, our study suggests that they can play a meaningful role in regional forest carbon management,” says Johnsen. “Over time, the rapid carbon accumulation associated with intensively managed southern pine forests can be balanced by the sustainable, disturbance-resistant carbon storage potential of longleaf pine forests. For more information, email John Butnor at jbutnor@fs.fed.us or Kurt Johnsen at kjohnsen@fs.fed.us.